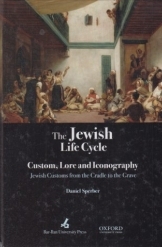 The Jewish Life Cycle Custom, Lore and Iconography, Jewish Customs from the cradle to the grave by Daniel Sperber, published by Oxford University and Bar Ilan University, new book, excellent condition, 676 pages and all pages intact. The rites of passage in the Jewish life cycle including circumcision, marriage, divorce, sickness, death and mourning and more. Includes explanations for the various practices both historically and today..